I'm doing pretty well so far with my 2011 resolutions. 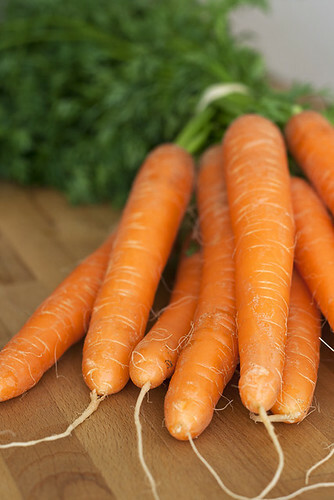 I woke up this morning and knocked out my yoga routine, and am weening myself off of soda and pasta with sweet, crunchy, fresh-from-the-market carrots. I'm more than 3/4 of the way through David Lebovitz's The Sweet Life in Paris, which literally makes me laugh out loud, because I swear I'm walking in his footsteps. Book 1 of (at least) 5 almost done! Continuing on my resolution train, I thought long and hard about today's tartines. My dad has been tossing the idea of doing a "red pepper" related tartine almost every time I talk with him, so these tartines kill a few birds (and resolutions) with one stone. For my resolution to eat more sustainably, I'm using Spanish mackerel in today's tartine. It is a fish which matures quickly and produces high numbers of offspring, which makes it one of the best choices when it comes to ocean-friendly eating. As an added bonus, it's also fairly inexpensive (about 9 Euros/kilo... about 5 Dollars/pound). This tartine also test my skills at cooking outside of my comfort zone. Since I'm now a lot closer (literally) to different cuisines, I figured I would start cooking a few things I've never cooked before. Giving a nod to my Dad's request to make a red pepper tartine, I paired the mackerel with romesco, a sauce originating from Catalonia, Spain, which consists of sweet roasted red peppers, tomatoes, garlic, and a few other goodies. Cut each mackerel fillet into two pieces, removing the reddish/brown blood line down the center of the fillet (where the backbone lies) as this part of the fish can be very strong flavored. Cut the fillets into small 1 inch pieces. Season with salt and pepper. Heat oil in a medium sized non-stick frying pan over medium-high heat. Carefully add the pieces of mackerel, skin-side down and press gently on the fish with the backside of a spatula, which ensures a crispy skin. After about 2 minutes, flip the pieces of fish and cook for another 2 minutes, or until cooked through. Transfer to a plate once cooked. Preheat an oven to 425° Fahrenheit (220° Celsius). Line a baking sheet with aluminum foil. Place the tomatoes, bell pepper, and garlic cloves onto the prepared baking sheet. Brush the vegetables with some of the olive oil, then sprinkle with kosher salt. Bake in the preheated oven until the garlic has turned golden brown, 15 to 20 minutes. Remove from the oven, and allow to cool for 10 minutes. While the vegetables are cooling, bake the bread slice on one of the oven racks until golden brown. Remove and allow to cool. Add the vegetables and any juices from the pan into a food processor or blender. Break the bread into pieces, and add to the food processor along with the toasted almonds, vinegar, paprika, and red pepper flakes. Puree until finely ground, then drizzle in the remaining olive oil with the machine running. Salt to taste. 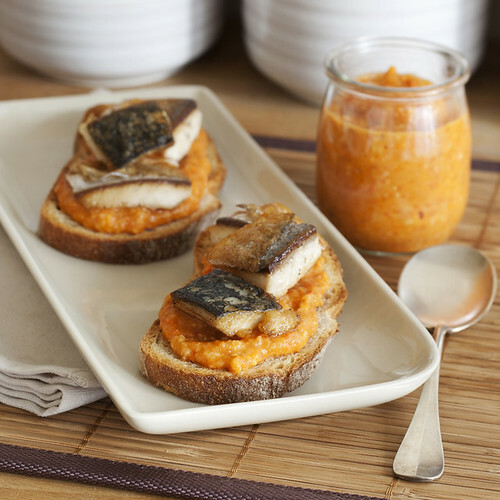 Spread romesco sauce over each slice of toasted bread and top with a few pieces of mackerel. Serves 4-6. Wow! We eat pan seared or grilled mackerel all the time as a side dish with rice, but this is an amazing idea for mackerel. And the sauce looks delicious too. I am definitely going to save this recipe. I am glad I have found your blog. Thank you so much! I just checked out your blog, and I love it! I'm wanting to cook more "outside of my comfort zone", and I love Korean food! I'm glad we can share recipes! I love Romesco sauce!! I make it all the time! Not a huge fan of mackerel, but salmon would stand in nicely since it's a strong-flavored fish. Congrats on finishing 1/5 books! Wow, I love your pictures! And this recipe is a must-try!